The brain stem is one of the most basic regions of the human brain, yet it is one of the most vital regions for our body’s survival. It forms the connection between the brain and the spinal cord, maintains vital control of the heart and lungs, and coordinates many important reflexes. The brain stem is a tube-shaped mass of nervous tissue a little over 3 inches (8 cm) long. It is located at the base of the brain, superior to the spinal cord and inferior to the cerebrum. As the brain stem ascends from the spinal cord, it widens and becomes more complex in its structures, both internally and externally. The exterior of the brain stem consists of white matter that conducts nerve signals within the brain stem and to the spinal cord and other regions of the brain. Masses of gray matter, known as nuclei, perform the processing role of the brain stem. The reticular formation, a network of mixed gray and white matter, extends throughout the interior of the brain stem and plays an important role in stimulation of the cerebrum and the muscles of the body. 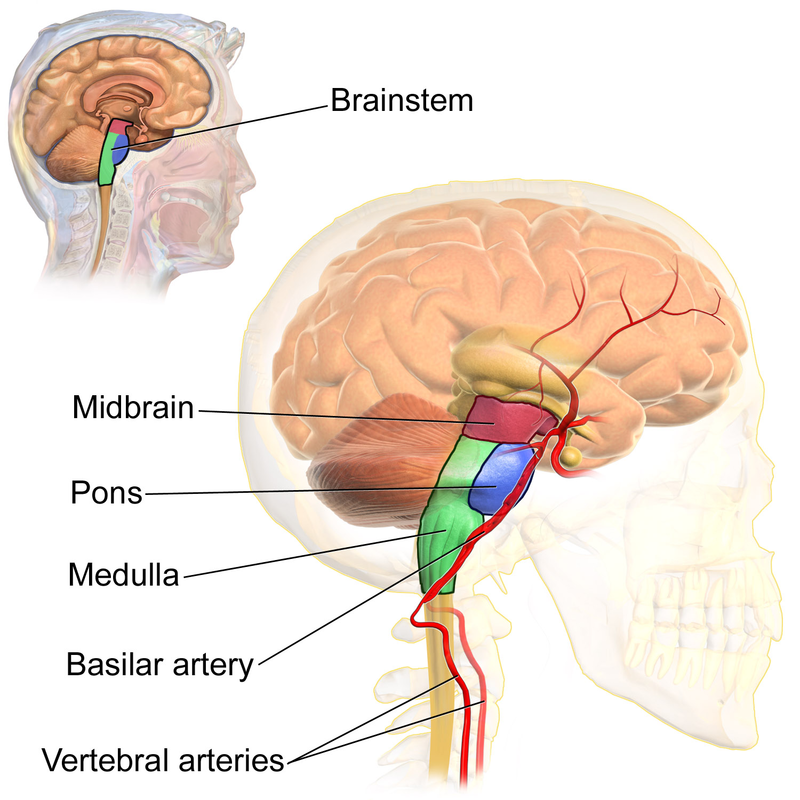 Three major regions make up the brain stem: medulla oblongata, pons, and midbrain. - The medulla is the inferior-most region of the brain stem that connects the brain to the spinal cord. It is a tube very similar structurally to the spinal cord, but is wider and contains several masses of gray matter internally. - Superior to the medulla is the pons, which is larger and structurally more complex than the medulla. - Finally, the midbrain forms the most superior and most complex region of the brain stem. - The spinothalamic tract for pain, itch, and other signals. Ten of the brain’s twelve cranial nerves also originate in the brain stem, providing vital connections between the brain and the sensory organs, heart, and digestive organs. The reticular formation, which extends throughout the brain stem, performs several important functions, including the stimulation of the cerebral cortex and the production of muscle tone. Stimulation of the cerebral cortex by the reticular formation produces the effect of being awake and conscious, while the inactivation of the reticular formation leads to sleep. The medulla contains all of the neurons that connect the brain to the spinal cord, and it is at the level of the medulla that about 90% of these neurons switch from the left side of the body to the right and vice versa. Although the reason for this switch is unknown, it explains why the brain feels and controls the contralateral side of the body. These neurons passing through the medulla also form many relays, where one neuron passes its signal on to another neuron that continues onward to the brain or body. Nuclei of gray matter in the medulla include the cardiovascular center, which controls the heart rate and blood pressure, and the medullary rhythmicity area, which controls the breathing rate. Many vital survival reflexes are integrated in the medulla, including those for swallowing, vomiting, and coughing. - It connects the cerebellum to the other regions of the brain. Several nuclei in the pons work with the medullary rhythmicity center to control breathing, while other nuclei form the roots of several cranial nerves. The midbrain plays important roles in communication and in the control of the motor system, vision and hearing, and the reflexes related to visual and auditory stimuli. Like the pons and medulla, all of the neurons descending to the lower brain stem, cerebellum and spinal cord and ascending to the diencephalon and cerebrum pass through the midbrain. Most of these nerve fibers pass through a pair of rounded anterior structures known as the cerebral peduncles. Posterior to the cerebral peduncles are nuclei, including the red nuclei and substantia nigra, which control muscle movements in the body. The most posterior part of the midbrain, known as the tectum, contains two pairs of rounded projections: the superior and inferior colliculi. The superior colliculi contain many nuclei involved in controlling they eye to produce vision, including focusing, scanning, and blinking. Nerve signals that control the eye are carried by the oculomotor nerve, whose roots arise in the superior colliculi. The inferior colliculi play a similar role for the sense of hearing by forming relays for auditory pathways to the cerebrum. Auditory reflexes, such as the startle reflex in response to loud sounds, are processed in the inferior colliculi.